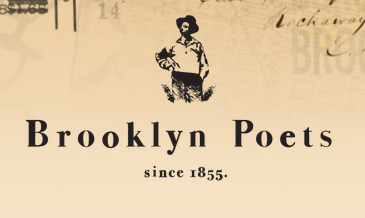 Brooklyn Poets is a great new organization that hosts a reading series, poetry writing classes and workshops, as well as a monthly “YAWP,” which allows poets to try out new work or share old work. They also produce some of the coolest t-shirts available. Each week, they feature a Brooklyn-based poet on their website, Brooklyn Poets, including one of their poems and an interview conducted via email. I was honored to be Brooklyn Poet of the Week for October 14-20, 2013. They featured my poem “Running,” along with a brief explanation about the writing of the poem, and the interview below. Promoting my new book of poems, FALLOW FIELD. I have a bunch of poems I wrote last April during National Poetry Month that need my attention soon, and another big poem and prose project I put aside some years ago and need to get back to work on. I also have another book of non-fiction that is in proposal development with my agent. A good day is spent with the love of my life, Samantha, doing whatever we want, with or without our kids (we have 6 between us), and always involves some poetry, cooking a good meal, drinking some wine, eating chocolate, plenty of coffee, and a whole lotta love. And, these days, exploring Brooklyn, our home. I returned to Brooklyn nearly two years ago and live in Park Slope, although I spend part of every week in Philadelphia, where my kids live. I lived in Carroll Gardens and Bay Ridge years ago. I love Park Slope because it feels like a small town and we’re close to the Park. I love city life, but I need to be close to its nature, too. Samantha and I got engaged this spring and when we were looking for a venue for our wedding, we stumbled upon the Green Building in Carroll Gardens. It used to be a brass foundry. When she sent me their website to check out, I noticed the building is located on the corner of Union and Bond. What better place for a wedding? It felt like the Brooklyn gods were shining on us. Auden, Whitman, Marianne Moore, David Ignatow and Ada Limón. Auden for his variety; Whitman, his YAWP; Moore for her eccentricity; Ignatow for his mundane humor; and Ada for the beauty of her language and vision. Favorite places to read and write in Brooklyn? Prospect Park. I do a lot of my composing in my head, especially while walking. The park is perfect for wandering. Some of the poems I wrote in April when I was writing a poem each day were composed on my iPhone on the 2 or 3 train. As for reading, I love reading in bed to my fiancée; she falls asleep whenever I start reading to her, but I just keep going. Ada Limón’s Sharks in the Rivers, Robert Wrigley’s Anatomy of Melancholy, Alfred Corn’s Tables, Frederick Seidel’s Poems 1959-2009, and Kathleen Jamie’s The Overhaul. For every meal I prepare cheers me as good and good for you. If you have time, write a nine-line poem using these end-words (in whatever order) from Jay-Z’s “Brooklyn Go Hard”: father, Dodger, jack, rob, sin, pen, love, Brooklyn, Biggie. Red Sox fans, not fans of the Dodgers. Bobby Orr, y’all, to me as a kid he was bigger than Biggie. When we traded him to Chi’town that was a sin. Blackhawks didn’t know Bobby and they don’t know Jack. My love, Samantha, is here and wherever my love is, that’s my home. Thanks to Jason Koo and Brooklyn Poets for featuring me as Brooklyn Poet of the Week.